Italy Reportedly Drops Case In Part Because Woman 'Too Old' To Be Harassed The former president of Italy's soccer federation is accused of groping a colleague. The New York Times and The Guardian say prosecutors believe the woman, in her 50s, was too old to be intimidated. 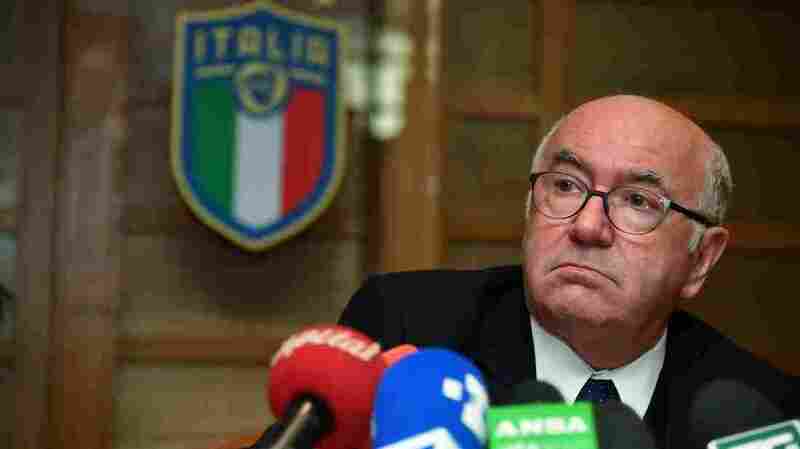 Former Italian Football Federation President Carlo Tavecchio looks on during a news conference held after his official resignation in Rome on Nov. 20, 2017. Tavecchio has been accused of sexual harassment, including unwanted groping, but prosecutors have declined to press charges. Cortani says the next year she used a hidden camera to record a second encounter with Tavecchio, where he groped her and kissed her as she tried to get away, both newspapers report. Cortani filed a complaint in November 2017, The Guardian reports. Tavecchio denies that the incidents happened. In a report that was obtained by The Guardian, prosecutors in Rome said that the allegations were likely true. However, they declined to press charges. Partly that was because the allegation was made too late, they said, but it was also because they believed Cortani was old enough, and knew Tavecchio well enough, that she wouldn't be afraid or intimidated in an encounter with him. Cortani is in her early 50s. Tavecchio is 74, the Times notes. "Maybe I am old for them, and I could have defended myself," Cortani tells The Guardian. "But I can assure that I felt in a position of inferiority, I felt afraid. Because being in that room meant being in the heart of Italian football. And in that room inferiority and fear have no age." A lawyer for Cortani confirms to the Times that prosecutors said Cortani's case was "incompatible" with her accusation, in part because of her age. Cortani's lawyer has challenged the dismissal of the case, and will argue that Tavecchio amounts to a public official and therefore Cortani has more time to bring allegations against him. Tavecchio, once the most powerful man in Italian football, is also infamous for making racist comments and "has also been recorded saying he preferred to stay away from gays and Jews," the Times notes. As NPR's Sylvia Poggioli reports, while much of the world has embraced the #MeToo movement and attempted to confront pervasive sexual harassment and assault, Italy has followed a different path. "The public has largely reacted with scorn and skepticism," Poggioli writes. Italian actress Asia Argento was one of the first to go public with allegations against Harvey Weinstein, but other Italians attacked her — comparing her to a prostitute. 10 women have accused Italian director Fausto Brizzi of molestation, Poggioli writes; when Warner Bros. responded by suspending projects with him, the Italian media wrote sympathetically about the plight of the director. "Since the allegations against Brizzi were made public, no major figure in Italy's media, business or political world has been publicly denounced for sexual harassment. "Feminist author Lorella Zanardo says Italians' double standard has roots in centuries of Catholic education. ... Zanardo also blames media tycoon and former Prime Minister Silvio Berlusconi, whose lowbrow commercial TV networks have helped shape Italian society for three decades. "As prime minister, Berlusconi popularized so-called "bunga-bunga" parties — bacchanals with minors and prostitutes — while his TV empire showcased women as desirable objects, dancing provocatively, never uttering a single word." Meanwhile, The Local reports earlier this year that nearly half of Italian women have experienced sexual harassment. Almost 9 percent of adult women experienced physical harassment or sexual blackmail at work, with "almost no one" reporting such incidents to the police.